A new study from Cardiff University reveals a unique approach to targeting the abnormal T-cells that cause T-cell lymphomas and could offer hope to patients with aggressive and difficult-to-treat cancers. 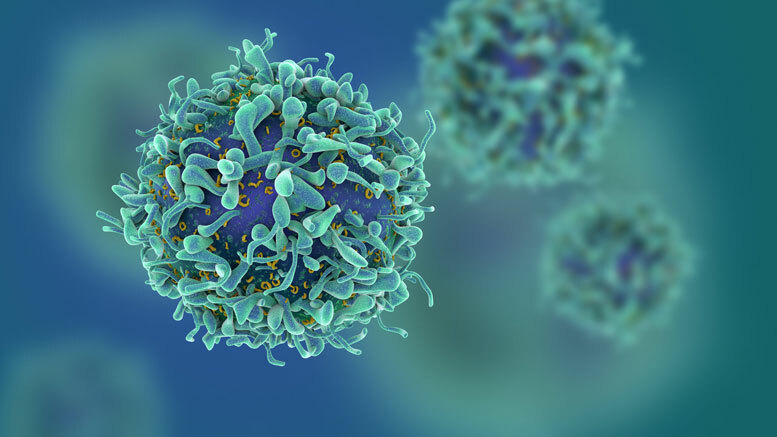 The team of researchers, working with biopharmaceutical company Autolus Ltd, have discovered a method of targeting the cancer without destroying healthy T-cells, essential to the immune system. Lymphomas arise when immune cells, called lymphocytes, that protect us against germs, become cancerous. There are two types of lymphocytes: B-cells and T-cells. Recent developments, including immunotherapies, have transformed the once fatal diagnosis of B-cell lymphoma into a curable condition but there remains a critical need for new therapeutic approaches to the rarer, but often more aggressive, T-cell lymphoma. A key challenge of treating these cancers has been to identify a way of eliminating the abnormal T-cells whilst sparing the healthy ones that play an essential role in providing protection against infections. T-cells recognize and remove germs using a molecule on their surface called the T-cell receptor. This receptor is made using one of two duplicated copies of the T-cell receptor gene, called C1 or C2, at random. As a result, the T-cells we use to fight off viruses and other germs are a near equal mixture of cells using either the C1 or C2 genes. When a T-cell becomes cancerous all the cancer arises from a single cell so that the cancer is either all C1 or C2. The research team have engineered a way to eliminate T-cells based on whether they use the C1 or C2 gene. The team demonstrate that targeting of C1 T-cells can kill C1 cancers while leaving all normal C2 T-cells unharmed so that they can take care of infections. Professor Andrew Sewell from Cardiff University’s School of Medicine said: “We wouldn’t last a week without the essential job our T-cells perform by protecting us from infection. The devastating effects of low numbers of just one type of T-cell are all too evident in HIV/AIDS. Dr Georgios Trichas, in Wellcome’s Innovations team, added: “This is an exciting development that could lead to new potential therapies for T-cell cancers. Previous efforts in the field have been held back by difficulties in distinguishing between normal and cancerous T-cells. Importantly, the researchers have not only been able to identify the cancerous T-cells but also shown how existing technologies that redirect the immune system can be adapted using this discovery to target and kill these cells. Although very promising, the study was done in vitro and in mouse models so more research is needed to prove it is safe and effective before it can be tested in the clinic. Be the first to comment on "New Technique Targets Cancer Without Destroying Healthy T-Cells"